M83 is a spectacular grand design barred spiral galaxy that is commonly known as the Southern Pinwheel Galaxy. 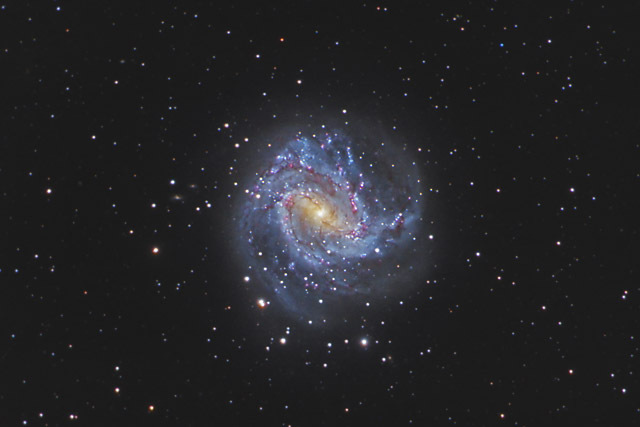 M83 is a starburst galaxy - a galaxy where a great deal of star formation is taking place. As such, the galaxy shows numerous beautiful Ha regions. M83 also has generated 6 observed supernovae in the last century, making it one of the most prolific supernova producers. In this image, North is up, This image is cropped to 48% of the original full frame. Software Used Images Plus 4.5 for camera control, calibration, stacking, digital development, multiresolution sharpening, smoothing and noise reduction, and realignment of color channels. Photoshop CS5 used for levels and curves, color correction, selective color, high pass filter, star shrinking, lab color, saturation adjustments, screen mask invert, lens correction, and smart sharpen. Gradient Xterminator for gradient removal. Carboni Tools for additional saturation adjustments, noise reduction, and smoothing. HLVG for additional color correction. Notes M83 is located well into the Southern Hemisphere at a declination of -30 degrees. As such, it is very low in the my sky. While photographing this object, M83 was always between 20 and 25 degrees high. This makes imaging very difficult, as the thick atmosphere causes seeing effects that tend to wash out the fine details. I'm extremely happy with the sharpness of this image, as I had expected a much blurrier image from an object so low in the sky. This image was published by Astronomy Magazine as its Picture of the Day for July 5, 2012. Its my second Astronomy Magazine Picture of the Day! This image also earned 1st place in Astrophotogallery.org's June 2012 "Hard-Galaxy" category. This image also won 1st place in the DSLR category of Cloudy Night's June 2012 Image and Sketching contest. This image was also published in the May 2017 edition of Nature Friend Magazine". And, this image was chosen again by Astronomy Magazine as its Picture of the Day for June 6, 2018!